At Hood & Associates, we know that the decision to switch accountants or even just find one for the first time can be overwhelming. We understand that and will do everything within our power to help you through that transition. We also believe that the best way to understand a firm and the quality of services they provide, is to hear it directly from people just like you who have decided to trust us with all of their financial needs. Here are just a few things our clients have said about us. This is my initial experience using Hood CPA’s…. I must say I highly recommend them! The customer service cannot be surpassed. Everyone is so pleasant and focused on me as an individual with individual needs and they surpassed anything I ever expected! Excellent in every way!!! I am certainly going to be a faithful customer from now on! Thanks! For being a place of great integrity and in whom I can trust! God Bless!!! If you’re looking for a company to trust with your taxes look no further! I’ve been using Hood & Associates for many years and have never been let down or felt uneasy. They are great at leaving no question unanswered and explaining anything to you that you might not understand. There’s no other company that I would rather use, everyone here is always so polite and courteous that I feel like family here. I highly recommend Hood & Associates CPAs! Hood & Associates have been great to us as a business and for me personally as well. If you are unsure whether you need their services then I would suggest sitting down with them and letting them walk through what they offer. I am the 3rd generation to use Hood & Associates. My grandmother who was born in 1892 was the first woman real estate broker in the state of Oklahoma. Ruth Sutton was her CPA. My mother who owned the Kennel Shop in Tulsa (for 60) years also used their services. I traded commodities for the Chicago Board of Trade and was a stock broker In New York for over 30 years.You can’t believe how many potential (messes) Hood & Associates-John Sternweis, my CPA has kept me out of. I sleep well at night knowing my CPA’s can handle any situation that may arise. I recommend them to my family and friends. 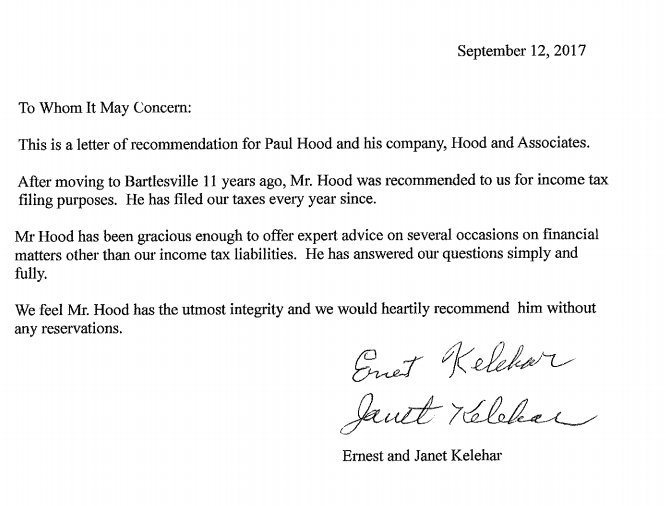 I have used Hood and Associates for several years now and have been very pleased with the assistance they have provided me. The staff is very friendly and accommodating, and this service gives me peace of mind. They have been available for all kinds of questions, and that is invaluable to me. I highly recommend them. My family has used Hood and Associates for more years than I can remember, as well as using them for the family’s business. They have always been fast, professional and correct in their tax preparations. When there are questions they answer them promptly and take time to explain what is often a confusing process. Bryce Is awesome to work with! He is easy to contact and responds to our needs quickly. The money he has invested for us is doing well and they always do a great job preparing our taxes. Thanks Hood & Associates, for your great customer service. We used the Bartlesville location 2 years ago but since moved so last year we contacted the Claremore office. Made sure that our information would transfer and it did. They were very helpful and quick to file. Same professional and friendly service that we received from Bartlesville. Recommended them to my parents. I have used Hood and Associates for a number of years for both personal and business tax and accounting. I could not be happier with the service that I have received. Hood & Associates has been our personal and business accounting firm for over 15 years. I would recommend Hood’s services to anyone and I have. Highly recommend, they work hard to help you get the most from your taxes and are truly concerned about helping invest in your future no matter what age. We have used Hood and Associates for as long as Paul Hood has been in business. We are very happy with the way he has taken care of us for all these years. He also does some investing for us. Very Happy!! Thank you Paul Hood & Associates! Hood and Associates have done my taxes for the past 15 years I will not go anywhere else. They are very professional and have their clients best interest in mind when preparing their taxes. Hood & Associates has provided my family with phenomenal service for almost 15 years. Wouldn’t go anywhere else! We live in the Kansas City area and continue to use Hood & Associates for our tax needs. We know things will be taken care of correctly and efficiently. We won’t trust anyone else with our taxes!